Sorry to say, but most people will eventually suffer from shoulder pain. Whether your pain is due to an injury or you simply woke up with the pain many of you worry that you might have a serious shoulder issue. The location of the pain in your shoulder might indicate to us what the problem might be. Pain on top of the shoulder is usually due to the AC Joint. Shoulders can bother us in many different areas. People can complain of pain on the side of the shoulder, the front of the shoulder, or the top of the shoulder. Most of the time a good shoulder doctor will know your diagnosis by listening to you for a few minutes. That is how important the location of the pain, and the cause of the pain are in determining why the top of your shoulder hurts or clicks. Shoulder pain can occur due to age or activity related issues such as arthritis. Pain on the top of the shoulder can also start following an injury. The most common type of injury which causes pain on the top of the shoulder is a fall directly on the side of the shoulder. The AC Joint is the most common cause of pain or clicking on top of the shoulder. The AC joint is created by the joining of the clavicle and a portion of the shoulder blade. This is a very small, yet very important joint. Every time you move our shoulder your AC joint will move. If you lift anything with your hand all the force will go through the AC joint. Therefore if your AC joint is bothering you, most activities might cause pain. 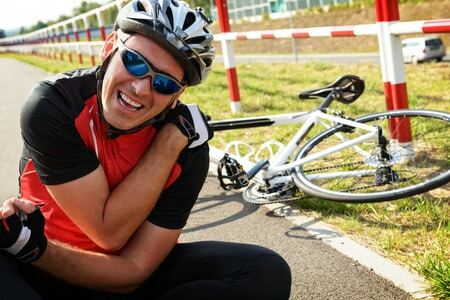 The AC joint can hurt due to recent traumatic injuries, age, or activity related repetitive stress. AC Separations: If you suffered an injury when you fell onto the side of your shoulder you may have AC joint separation. An AC separation implies that the ligaments that normally hold the AC joint together have been injured or torn. If the ligaments are simply strained or stretched then you will notice mild swelling, but you will not have a significant bump. 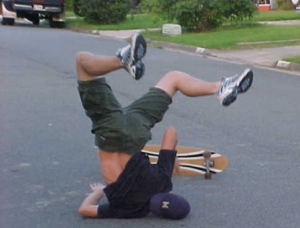 In more severe AC joint injuries you will notice a bump. Depending on the severity of the injury to the ligaments that hold the AC joint together you may have a small bump or a very alarming bump. Some of these bumps can look terrible. We created this video below which goes into much more depth about AC separations. Most AC separation do not require surgery. But we also cover who might benefit from surgery in far more detail during the video. Distal Clavicle Fractures: A unique type of clavicle fracture can occur after a fall onto the side of the shoulder. The word distal means “end”. So this would be a fracture of the far end of the clavicle near the AC joint. These fractures are usually managed without surgery. But, many distal clavicle fractures will not heal. Despite not healing, after 8-12 weeks most of these distal clavicle fractures will not cause pain. If a broken bone doesn’t heal, but doesn’t hurt we call that a painless non-union. Surgery for distal clavicle fractures can be very tricky and risky. Surgery will often fail, the screws and plates will often fail and need to be removed. Most of these fractures are best managed without surgery unless your surgeon offers you a very good reason why you should assume the risks of surgery. 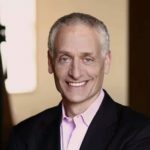 Many people will develop pain on top of the shoulder simply as a result of activity and lifestyle. The AC joint is a very common area for osteoarthritis to occur. Osteoarthritis of the AC joint is very common in general. If we x-ray anyone over the age of 45 we will find evidence of osteoarthritis of the AC joint. This does not mean that you are going to be permanently crippled. Most people with signs of osteoarthritis of the AC joint have no pain in their AC joint. Obviously, without pain, no treatment is needed. 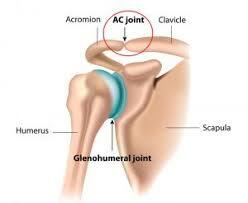 AC Joint osteoarthritis is probably the most common cause of clicking on the top of your shoulder. Clicking in this area without pain should not be a cause for concern. If you have painful arthritis of the AC joint we discussed that in more detail in this post. 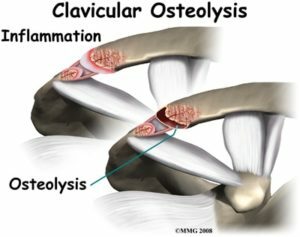 A very common cause of shoulder pain in weight lifters is AC joint “osteolysis.” I know, we use all these big words :-(. Osteolysis means dissolving bone. The clavicle is very small. It has a very small cross sectional area. It is smaller than a quarter in most of us. That means that all the weight you push is transmitting its force through that little bone. Over time that will lead to stress and inflammation. That inflammation can cause the bone to start to breakdown and dissolve. if a weight lifter develops osteolysis and wants to remain very active in the gym they will usually require surgery. Otherwise, if they decrease the weight they push they will usually feel better within a few weeks. But the pain will come back as soon as they return to heavy weight lifting. We call this issue a Weight-Lifters Shoulder… and I cover that in more detail in this post.